More ACEOs! This time I wanted to draw the cute surreal styles I used to do some time back. 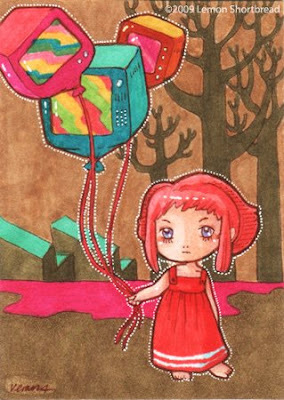 Entitled 'Square TV Balloons'. I think square-shaped balloons are a great idea (do they exist? ), and better if they could flash colours like iridscence in soap bubbles! wow, that is adorable and so unique!